All The Moments Outlander's Claire B.R.F. Was A B.A.M.F. Tonight, Caitriona Balfe has a chance to win a Golden Globe for her performance in Starz’s Outlander. (Along with Tobias Menzies and the entire show.) Let’s celebrate and wish her luck by recounting all of her best moments in Outlander season 1. Her world having just turned upside down, Claire is confused and then terrified when a man who looks like her husband suddenly has a blade to her throat and is threatening all manner of bodily harm. Never the wilting flower, Claire confronts her attacker head on, which delays and distracts him enough for another stranger to come give the man a timely conk on the head so she can get away. 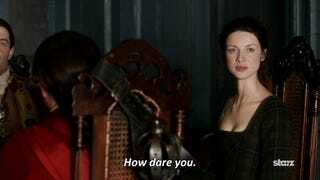 When she becomes trapped in Castle Leoch under suspicion of being an English spy, Claire doesn’t plan on staying long. She carefully reconnoiters the grounds of Castle Leoch, planning and plotting to escape from her imprisonment. Her plan involves drugging the MacKenzie men, stealing a horse, sneaking out of the castle and the grounds, and riding off to Craigh na Dun. She succeeds in distributing a sedative amongst the men and then sneaks away. When she runs into a handsy Dougal during her flight, she neatly whacks him over the head with a stool. 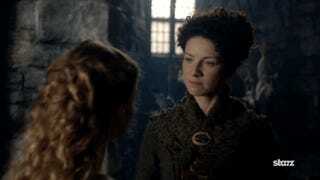 She does not have such an advantage over Jamie, however, and he halts her escape attempt (however politely). Claire goes on the road with the MacKenzie men as they travel to collect quarterly rents from Colum’s tenants. After seeing Dougal take a little extra under the table, Claire mistakes Dougal’s siphoning of rent money for greed, and has no qualms with giving him a piece of her mind. She disdains him for (seemingly) exploiting his tenants for his own gain, not knowing the true reason for Dougal’s off-the-books collection. Claire deftly ingratiates herself with a group of Redcoats in order to manipulate them into giving her a lift back to Inverness, where she can then sneak off to Craigh na Dun and back to 1946. Unfortunately, Black Jack interrupts her scheme and goads her into an impassioned speech that sounds a bit too Scottish-sympathizer for her new friends. While Claire is unable to avoid the trap, I am including this because I appreciate every moment that Claire goes toe-to-toe with Black Jack. After first feeling awkward and uncomfortable being newly wed to Jamie Fraser to save her from Black Jack, and being obliged to consummate the marriage, Claire takes the bull by the horns, ahem, so to speak. She becomes invested in the budding relationship between herself and her new husband, and having come to that realization, exerts control over the situation and over their sexual experiences. 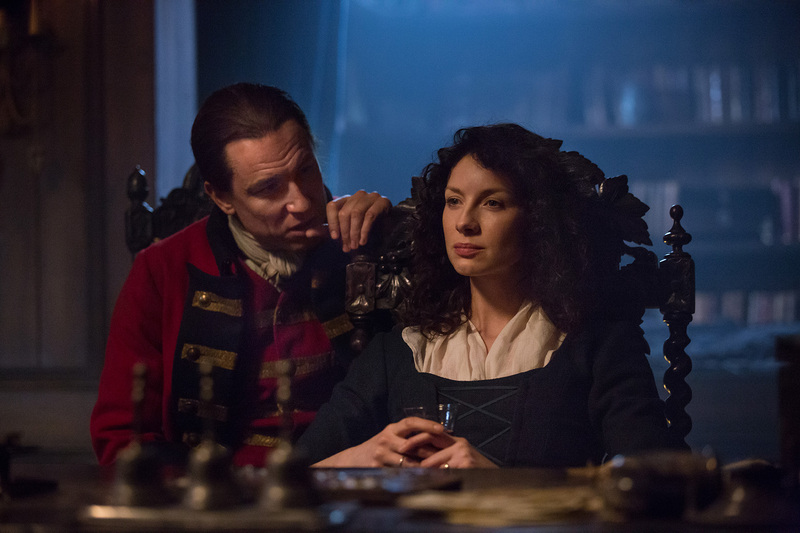 The show turns the tables and allows Claire to ogle Jamie and order him about, in a groundbreaking execution of the “female gaze” which lends even more agency and power to Claire. 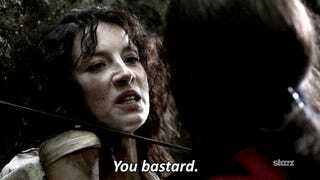 At this point after their return to Lallybroch, Claire has zero fucks left to give about Jamie’s high-and-mighty-ness, and she finally lays him out, physically and verbally. 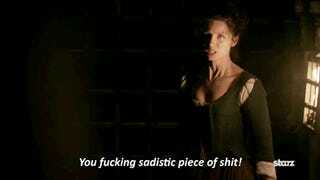 She basically tells him to cut the crap, grow up, and start being a responsible laird, rather than a well-liked one. After Claire and Jenny gallop off in pursuit of Jamie and his redcoat captors (giving us the moment in the top image), and discover he has escaped, Murtagh joins the party and he and Claire continue the search. They have trouble finding him, so they shift strategies. The pair roam the countryside as a double act, making as much of a fuss as possible to draw Jamie out from hiding. This brings about Claire’s debut as a cross-dressing bawdy singer, her reaction to which is depicted above. Still, she overcomes her fears and does whatever she can to find Jamie. Tell us how you really feel, Claire. This moment was the culmination of her tense rescue attempt (preceded by an entire season of tension). Claire and Black Jack have played games in all of their previous encounters. 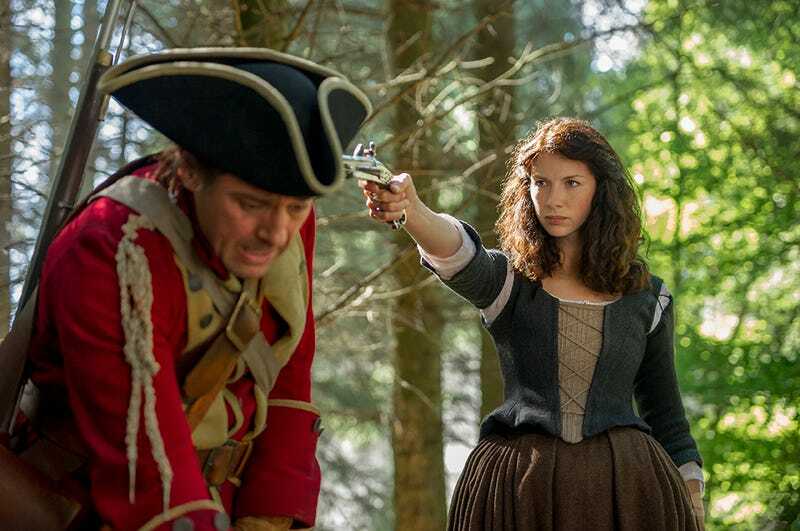 There’s a sense of resignation and release in Claire’s attack here - finally, Black Jack has the upper hand, and Claire no longer has a facade to maintain, and the only thing left for her to do is rail at him in a cathartic, yet futile, moment of rage. Damned if I didn’t cheer. 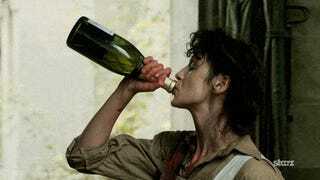 Now, let’s all drink to Caitriona Balfe’s performance and hope that season 2 will provide more opportunities for her to shine! Let me know if I missed any of your favorites in the comments. All images from the Starz Outlander website unless otherwise noted.